"“Do you know the difference between education and experience? Education is when you read the fine print; experience is what you get when you don’t.”"
In Memoriam. Exclusive Clips and Interviews from The Power of Song (2008). 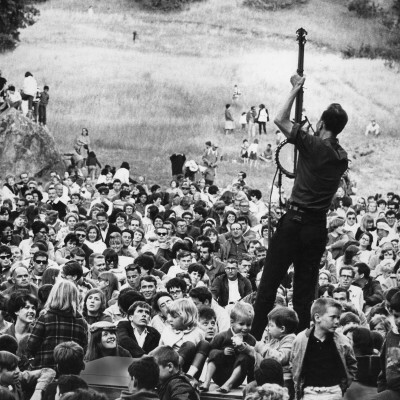 Pete Seeger: The Power of Song - In Memoriam. Exclusive Clips and Interviews from The Power of Song (2008). Pete Seeger (May 3, 1919 – Jan. 27, 2014) helped introduce America to its own musical heritage, devoting his life to using the power of song as a force for social change. Standing strong for deeply-held beliefs, Seeger went from the top of the pop charts to the top of the blacklist and was banned from American commercial television for more than 17 years. This determined singer/songwriter made his voice heard and encouraged the people of the world to sing out along with him. The Emmy Award-winning American Masters Pete Seeger: The Power of Song premiered February 27, 2008, and will be broadcast several times on PBS, starting January 30, 2014. Check local listings. This first and only authorized biography of Seeger was directed by Jim Brown and features Seeger, Joan Baez, Bruce Springsteen, Natalie Maines, Tom Paxton, Arlo Guthrie, and others, plus archival footage. See clips and listen to our PBSAmericanMasters Spotify Playlist “Rest in Peace, Pete Seeger,” below. Our PBSAmericanMasters Spotify Playlist features 30 Pete Seeger recordings. Sign up for a free Spotify Account to listen to the playlist, Rest in Peace, Pete Seeger.